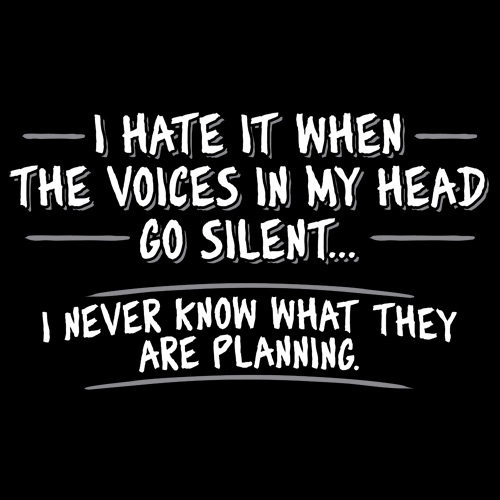 I've often asserted that each of us has voices in our head. A voice of good and proper. The voice of good and proper is often depicted as little angel version of us on one shoulder. 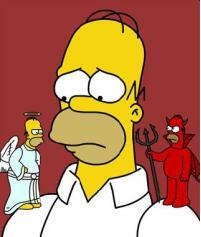 The voice of deviousness on the other hand is often depicted as a little devil version of us on the other shoulder. The voice of good and proper of course is depicted as the killjoy. The voice of deviousness is considered the funny one. But, I digress. I will focus on the voice of deviousness. I refer to the devious or 'bad' voice as the voice of insanity. It doesn't care what trouble it gets you into. It just wants to be inappropriate, funny, even a little mean. I believe that voice comes out more when you are super tired, under a lot of stress, or have had a bit too much wine. It is a battle sometimes, the voice of good (VOG) says don't say it or do it while the voice of deviousness (VOD) says, go ahead and say it or do it. The VOD is like a little like a kid who keeps on asking his or her mom or dad for permission even after their parents have said no. Eventually, the VOD hopes to wear us down and sometimes it succeeds. We give in or cave hoping that it will leave us alone and it does for a while often. 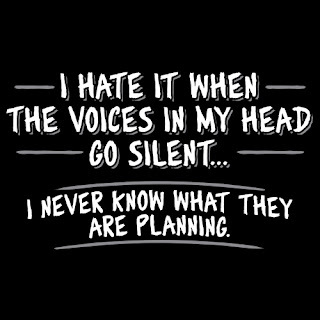 When I "go there", I explain it away by saying the "insane" voice in my head told me to say it and I had to listen or say, "there I said it, got it out of the way and will never have to say it again". My other favorite line is that "I was just following the script and the script said this and you know you can't go against the script". You know as if there is a script and we can't step out of character. I will wrap this up by letting my insane voice talk a little. My insane voice wanted to tell you that he was behind these situation (or at least how I handled them). My fiancee Kristi was at church with me when the minister said that Jesus instructed his disciples to "Follow Me" and I smiled looked over at her and let her in on my imagining Him dancing and singing and instructing them to "Follow Me" like Uncle Kracker did. One episode of Extreme Home Makeover I was watching as the gang built this house for this poor lady who was in a wheelchair who had a disease which made her bones brittle and easily breakable. Anyway, the did all kinds of things to make it safe for her. At the end of the show they put their hands and arms in a circle and said, "Go team" or whatever and quickly lifted them up. I imagined them accidentally knocking over the poor old lady and giggled. My ex wondered what was so funny. I prefaced it by saying I know this is not right, but... Of course, she didn't particularly think it was funny, but I noted that I didn't try to think it and warned her before I told her. I noticed my cat Simon when I was sort of walking in front of him, his eyes were following me and it occurred to me at a later point, I wonder if this applies to humans too. So, at a later point, I started pacing back in forth in front of my ex to test this theory and found that humans can't help but to naturally follow us as we move back and forth too. Of course, she said, "stop that" at which time I let her in on my testing a theory. Olivia just stared back when I tried this on her: smart girl. I liked the song, "Take a Walk on the Wild Side" and had just heard it. My dog Sherman was around and so was Olivia's grandma and her mom. I noted Sherman's nice colors and markings. Anyway, my insane voice said, how about the song from Sherman's perspective. "And the colored dogs go 'bark ba bark bark ba bark..." Make a bark on the wild side. I believe they thought I was crazy, but even so, they had to laugh at that one. She said, "where did you find him? ", meaning me. One my all time favorites is when someone asks a question or talks about something and I just stare at them and don't say anything. I've noticed that most of the time we seem to thrive on or expect feedback whether it is just a nod or "uh huh" or whatever. So, depriving them of feedback can sometimes discombobulate them. Messing with the mind of someone who has a sense of humor is fun, but sometimes it is even more fun messing with the mind of someone who doesn't. Anyway, back to I of course, being me, discussed this concept of the good vs. devious voice with Olivia and she seemed to understand and appreciate that. I expect to get payback one day from Olivia for unleashing my devious voice a bit on her.